In today’s post-feature phone universe, your smartphone is your wingman. There are apps out there to help bring you to booze, get liquor in you faster, get you home, and everything in between. 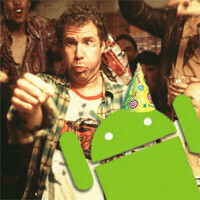 Today we’re going to take a look at a few must have apps when you’re getting drunk with Android. So without further ado, let’s get Andrunk! Liquor Run Mobile is Google Maps for the important places - places that sell alcohol. Liquor Run Mobile is able to use your GPS or entered location to find nearby liquor stores. It provides turn-by-turn directions and tells you closing times before you go, so not a minute is wasted. In addition to the necessities, Liquor Run Mobile also has facts, stats, and reviews on beer and a Safe Ride feature to help you find a ride home at the end of the night. Liquor Run Mobile is free in the Google Play Store. Mixology Drink Recipes does just what it says - provides you with drink recipes. It has over 7,900 drink recipes and over 1,300 ingredients. It has a liquor cabinet feature that allows you to enter everything you have on hand and Mixology will provide you with what you can make. For those nights that you just don't care anymore, Mixology offers a Random Drinks slot-machine to give you plenty of great ideas. Finally, Mixology also features a Bartending tab to educate you on bartending supplies, terminology, and bar tending tips and tricks. Mixology Drink Recipes is available in the Google Play store for free or $1.49 for an ad-free experience. Whether you're spending the evening with a special guest or are just in the mood for a good wine drunk, Hello Vino has got you covered. Hello Vino helps you pick out the perfect bottle. It allows you to choose by food pairing, special occasion, tastes and styles, and countries and regions. Hello Vino also gives you tasting notes and ratings, so you can pick out wine with the same level of skill as you use to drink it. Best of all, Hello Vino is free in the Google Play store. YES! Power Hour is just that - a classic power hour drinking game. You can customize how many beers and/or shots you want to drink, adjust the time between drinks, and manage music. Power Hour is able to send notifications via the status bar, text-pop, sound alert, or vibrate. It is able to run in the background and will pause for incoming calls - because this is something you want to tell people about while you do it! Oh, speaking of which, it also has Facebook sharing integration, which is probably a terrible idea. Once again, free in the Google Play store. Oh, everyone just decided they want to play Kings (also commonly referred to as King's Cup or Ring of Fire), but no one has a deck of cards? Fail no longer with the Kings Drinking Game app. Kings provides you with a virtual deck right in the app so you can get right to the good stuff. It also allows the user to add rules to the game - curse you little green man! Kings Drinking Game is available for free in the Google Play store. AlcoDroid is an alcohol consumption tracker. It is great whether you are trying to beat your personal "high score" or you're trying to keep yourself in check before you start telling weird stories and hugging strangers. AlcoDroid calculates your BAC (blood alcohol content) based on your logged drinks and estimates when you get back to the legal limit. You can also chart your drinking habits and generate alcohol consumptions statistics. Finally, you can create custom drinks and favorites so you can log quickly. If you are looking for a fun, rewarding hobby and love beer, look no further than homebrewing. For those of you unfamiliar with the sport activity, there is a lot that goes into constructing the perfect pint. BrewR provides you with timers to assist you with adding hops while brewing. It also has recipes, editable ingredient database, BJCP style reference database, can calculate OG, IBU, color, estimated ABV and FG, and lets you adjust brewhouse efficiency, batch size, boil volume, and recipe type of each recipe. BrewR is free in the Google Play store. Let's face it, sometimes last call comes around and you realize you cranked it to 11 that night. We've all been there. The most important thing is getting home safe. Taxi Magic is a free electronic nationwide taxi booking app. You can find a taxi, book a taxi from within the app, track your ride through dispatch updates, and even pay for your cab with your credit card. Taxi Magic's Magic Booking service works with 65 leading taxi fleets in over 40 major U.S. cities. The tap-to-call feature works in 4,000 U.S. and Canadian cities. Taxi Magic is free in the Google Play store and is great to keep on your phone so you have it in case you need it. What about untappd.com ? That's all about Beers ! BOOZING! woot! :) be careful with that BAC app. how much alchohol is in your blood is very dependant on size, weight, liver & kidney function, tolerance,ect. It might be a nice guestimate but dont take it as fact. Im goin to download liquor run mobile seems the best of all.. when im at a friends house or club its always good to know were your nearest liquor store is .. lol looking at the phone while drinking is not the best idea though!